Rotary Brookmans Park is busy organising its annual Charity Swim Challenge. 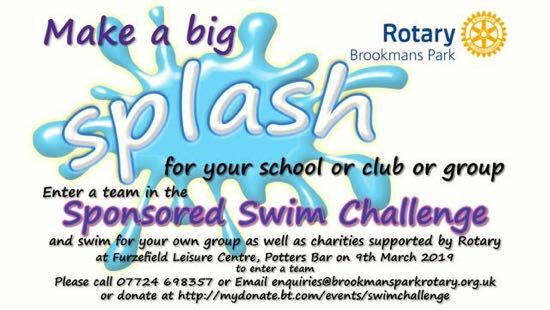 It will take place at the Furzefield Centre pool in Potters Bar on Saturday 9 March from 5.30pm. Rotary is looking for teams of four or five swimmers to swim as many lengths of the pool, in relay, as they can in 20 minutes. The sponsorship each team member raises will be split 50/50 between the Rotary Club and a charity, school or club of the team’s choosing. Anyone interested in taking part should contact Rotary on 07724 698357 or email enquiries@brookmansparkrotary.org.uk for an application form.